There’s a lot more to moving a large storage tank than simply calling up a trucking company. It also involves loading/unloading services, liability issues and careful scheduling and tracking. Planning and successfully executing the transport of a bulk storage vessel can be tricky and if not handled correctly, may end up costing you significant amounts of extra time and money. If buying a new LPG storage vessel, transportation services might be provided by the tank manufacturer. If buying or selling a used tank, you may need to coordinate transportation and delivery yourself. Whatever the case, you need to educate yourself on the process and get familiar with the risks associated in the transportation of bulk storage tanks. Reading this short article is a good start. In it you’ll find information related to tank loading/unloading, crane services, transportation liability, and DIY tips. For additional information specific to shipping costs, read our article entitled Understanding Freight Costs on Bulk Storage Vessels. Loading and unloading primarily refers to crane services. Most often, the tank seller will include costs associated with loading the vessel onto the trailer in the price of the tank. However, there are occasions when loading is not included in the price. Make sure to ask ahead of time so you know for sure. Costs associated with unloading are almost always the responsibility of the receiver. The buyer of transportation services needs to make sure there is clear access to the site. Any site modifications or work required to enable access for the truck and trailer is the buyer’s or receiver’s responsibility. Transportation service providers typically include a set amount of time for unloading the vessel from the trailer. Anywhere from 1-2 hours is common. Beyond that time, hourly fees apply so it’s important that the receiver is prepared to quickly and efficiently unload upon arrival. Whether loading or unloading, crane service is a primary concern. Depending on crane size, proximity of the crane and complexity of the job, the cost to lift a 30,000 gallon tank can range from a couple thousand dollars to upwards of $5000. If moving larger tanks, two cranes may be needed. Crane costs can consist of a charge based on miles to the site, a flat rate for use of the crane, hourly charges for the operator, and fees for belts, straps or other equipment used. You can also expect to be charged overtime on any hours exceeding some set amount originally agreed to. Given the significant costs involved, anyone hiring out for crane services should try to limit their risks and avoid having the crane come on site until a) the truck handling pickup is verified and on schedule, and b) the truck handling delivery has arrived at the destination or is in close proximity. 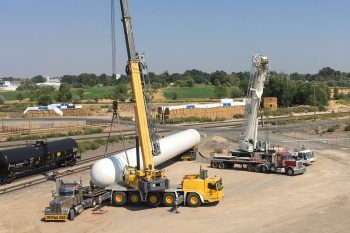 In situations where the crane will be brought in from 20 or more miles away, receivers should see if the trucking company will agree to arrive with the tank the night before. Doing so allows you to confidently schedule the crane for the following morning knowing the tank has already arrived. Understand there can and will be delays due to traffic, road construction, accidents, permitting issues, weather, breakdowns or other issues. It’s important to be prepared for that, closely monitor transportation progress and work with the crane service to keep a flexible schedule. Industry standard is FOB shipping point. This means among other things, that the shipper is liable for any damage to the tank until the truck leaves the shipping location. Once the truck has left the origin, liability is passed on to the trucking company and remains with the trucking company until the truck reaches the destination. Trucking companies will generally carry in the area of $1M in liability insurance to cover any damage that might occur to the tank during transit. You are certainly within your rights (as a shipper or receiver) to ask for proof of that coverage prior to the move. Once at the destination, liability is transferred over to the receiver. Upon arrival, the receiver should do a thorough check for any damage to the tank prior to unloading. And don’t forget to check the top of the tank – gouges, scrapes and dings from run-ins with bridges and other low hanging obstacles do happen. If damage is found, it must be noted on the bill of lading (BOL) for a claim to be considered. If you are shipper, receiver or both, it is a very good idea to take pictures of the tank prior to loading, after loading, upon arrival at the destination, and after unloading. Those pictures may be your best proof of any potential damage caused during the process. Get several quotes. Bulk storage transportation rates can vary widely. Make sure the logistics company and/or trucking company is reputable; ask for references, check online reviews and Better Business Bureau reports. Get in writing, agreements related to liability associated with additional costs incurred especially as they relate to permits, loading/unloading and crane service costs. Determine who’s responsible for other items and costs such as; dunnage, chains, straps, and saddles used to position the tank on the trailer, touch-up’s for abrasions resulting from shipping and handling, and import/export taxes or border brokerage fees for vessels coming into or leaving the U.S.
Identify the persons responsible at both the pickup location and destination. Share specific pickup/delivery addresses and contact information of the shipper, trucker and receiver with anyone that may need to get in touch with them about transportation updates. Track shipment progress daily and update the receiver on any delays or changes to the schedule so they can modify the crane schedule and other affected services. Planning and successfully executing the transport of a bulk storage vessel can be tricky and if not handled correctly, may end up costing you significant amounts of extra time and money. Do your homework to familiarize yourself with the challenges and address any areas for concern ahead of time. When ready to get started, be sure to have written agreements in place, share contact information across all parties, and keep a close eye on progress of the move so you can adjust crane services or other schedules as needed.